Low back pain is one of the most common complaints seen at a chiropractic office. There are many different conditions that cause or contribute to lower back pain. If you or someone you know is suffering from lower back pain from one of the conditions listed below, your local chiropractor for low back pain, Dr. Jimmy Sayegh can help. Auto Accidents: Getting into an auto accident can injure the muscles, tendons and ligaments of your spine. Often, auto accidents to lead to not only acute but long term chronic low back pain, disc injuries, spinal nerve compression and more. Chiropractors are one of the leading health care providers that help with injuries due to auto accidents. Bulging or herniated discs: In between the bones of our spine, he have cushion like structures that we refer to as intervertebral discs. A disc may bulge outward and put pressure on our spinal cord as it exits our spine. Herniated discs occur when the soft interior of the disc escapes through tears in the outer fibers. 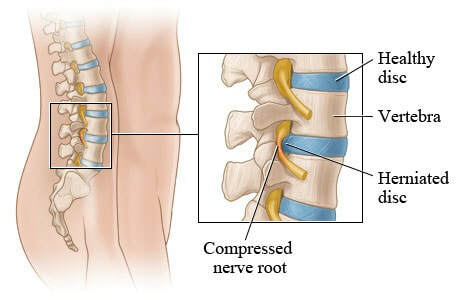 Disc problems can not only cause nerve compression and inflammation but severe local lower back pain. Arthritis: Also referred to as spine osteoarthritis or spondylosis, is a common degenerative spinal problem that occurs through age and wear and tear on our spine. Spondylosis affects all portions of the bones of our spine and can lead to decreased overall range of motion, pain and impingement of our spinal nerves. ​Spinal Stenosis: A condition that develops when the spinal canal or a nerve passage was abnormally narrows. Spinal stenosis can occur from various conditions such as: Osteoarthritis, degenerative disc disease or bulging discs. Spondylolisthesis: A condition that develops when a vertebrae of the lumbar spine slips forwards over the vertebrae below. Spondylolisthesis can occur from trauma or overuse and weakening of the spine.